Yoshi's Island as it appears in Smash. For other stages with this name, see Yoshi's Island (disambiguation). Yoshi's Island (ヨッシーアイランド, Yoshi Island) is a stage in Super Smash Bros. Brawl and a familiar stage in Super Smash Bros. for Nintendo 3DS and Super Smash Bros. Ultimate. It could be considered the spiritual successor to Yoshi's Story from Melee, due to a similar structure and stage elements with a similar behavior and function. The Blarggwich and Fly Guys in Brawl. There is a main, slightly curved platform whose walls reach the bottom blast line. A long soft platform floats over it, and periodically tilts during play. A Blarggwich randomly rises from either of the side pits, creating a temporary platform that can save recovering characters. Some Fly Guys also randomly descend, carrying food unless it is turned off in the Item Switch. They can be hit and defeated by attacks, dropping their baggage, and are particularly prone to intercept projectiles. The stage will also change between the four seasons during the match, playing a sound every time (no sound is played in Smash 3DS). These changes do not affect the gameplay in any way. The season at the start of the match is chosen randomly. Spring: Scenery here distinctly resembles the pastel-drawn backgrounds of the Overworld stages in Super Mario World 2: Yoshi's Island. Giant red tulips, like in the first level of Yoshi's Island, appear behind the stage. Summer: Flowers, resembling the Special Flowers in Super Mario World 2: Yoshi's Island, sprout everywhere with the coming of summer. Autumn: Fall colors take over and stationary Goonies appear, hovering in the sky with a four-frame animation. Wheat grass appears in the background. Winter: Heavy snowfall is this season's main addition to the graphics. Like most weather effects in Brawl, the snow is not rendered in 3D: this can be seen by pausing and angling the camera. 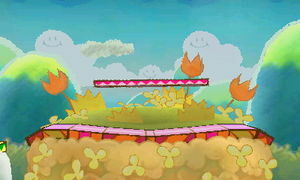 In Super Smash Bros. for Nintendo 3DS, the Ω form of the stage, the stage will cycle through the seasons as normal; however, no sound effects will play, and only the Spring/Summer mix of the music will be heard. The base doesn't bend, the thin platform is absent, and the Blarggwich and Fly Guys don't appear. In Super Smash Bros. Ultimate, the Ω form and Battlefield form are similar to SSB4's Ω form; however, the stages do not extend below the blast line, and they are resized and reshaped to match Final Destination and Battlefield, respectively. In the Battlefield form, the top soft platform resembles the green platform on top of Blarggwiches, and the two bottom ones resemble the red soft platform of the normal form. "Make Eggs, Throw Eggs," the first level of Super Mario World 2: Yoshi's Island. A Blarggwich in Sluggy the Unshaven's Fort. This stage is based on Super Mario World 2: Yoshi's Island, which marked Yoshi's first appearance as a standalone playable character. Yoshi's Island has very distinctive graphics, designed to look like pastel drawings. Blarggwiches are ghostly entities that act as moving platforms, which Yoshi has to ride in certain stages. 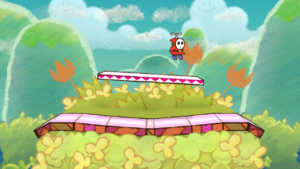 Fly Guys are one of the many varieties of Shy Guy in the game. They fly around carrying items, dropping them when attacked. Some float in a specific path, while others stay onscreen for a limited time before fleeing. Each season represents specific levels, and several other graphic elements in this stage are directly taken from the source game: Chomps and Goonies are recurring enemies, and the smiling flowers which appear in the Summer version resemble the collectible Flowers which contribute to the final score in each level. In Brawl, Yoshi's Island is usually a starter stage in most tournaments due to it lacking overly disruptive features, though it is sometimes a counterpick. The Shy Guys can disrupt projectiles such as Falco's Blasters, and can gimp Ness's and Lucas's PK Thunder recovery. The walls on the side of the main platform prevent characters such as Meta Knight and Pit from gliding underneath the stage and make it more difficult for characters to be stage spiked. Donkey Kong does notoriously well here, as the tilted ledges allow him to climb back onstage earlier when using ledge drop to jump and Spinning Kong: performing this causes Donkey Kong to retain his ledge intangibility frames until the move ends. The Blarggwich can also aid characters' recoveries by acting as a platform to land on, but if Ness and Lucas are trapped between it and the stage they will not be able to recover. 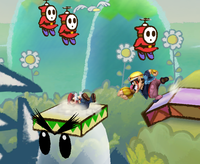 In Ultimate, Yoshi's Island is normally legal, as turning off stage hazards removes the Shy Guys and Blarggwich. It is often a counterpick, as the slant can block some projectiles. Timelapse of the season change in Brawl. Yoshi's Island in for 3DS. Yoshi on the stage in Super Smash Bros. for Nintendo 3DS. Ness getting shot out of a Super Launch Star on the stage in Ultimate. While using Olimar's Final Smash, End of Day, a drawing of a moon can be seen in the sky. This moon was the location of the battle against World 5 boss Raphael the Raven in Yoshi's Island. This is the third stage in the series that is named "Yoshi's Island". However, it is the first of these to be based on the game Yoshi's Island. The Blarggwich can be seen off-screen by pausing while it isn't supporting the characters. This is the only stage in Brawl from Mario or any of its sub-universes to not be restricted in any tournament, as Delfino Plaza, the only other Mario-related stage that is not banned, is almost always a counter-pick. There is an extra track that can play in this stage. The Obstacle Course track that is listed in "My Music" and in the Sound Test is the variation that plays in the spring and summer seasons. There is another variation that plays during autumn and winter, but it is not available in the Sound Test, though it is available in the OST rip. However, in Super Smash Bros. for Nintendo 3DS, both versions of Obstacle Course are in the sound test, as Obstacle Course (Spring / Summer) and Obstacle Course (Autumn / Winter). In Super Smash Bros. for Wii U, meanwhile, the songs play back to back. Oddly, one of the pictures in the press kit for Ultimate of this stage has text in top left that reads "<DEBUG> SEASON=SUMMER". This is only version of Yoshi's Island that has never been renamed, as Smash 64 and Melee's versions of Yoshi's Island are named "Super Happy Tree" and "Yoshi's Island (Melee)", respectively. Because of this, it and the Yoshi's Island stage from Melee are the only two stages to share the same name in Ultimate. All other stages that share names, such as the "Kongo Jungle" stages from Smash 64 and Melee, were renamed for disambiguation purposes. In Ultimate, there is a glitch involving the Smart Bomb that causes the music to stop playing. It is currently unknown, however, why this happens. It is also unknown if this glitch will work on other stages. Page on the Smash Bros. DOJO!! This page was last edited on April 16, 2019, at 18:40.